A new year and what better way to start it by participating in free motion quilting (FMQ) groups and alongs! Nothing like having to be accountable. This will help me in my desire to improve my FMQ and to finish some of my UFO's and WIPs. 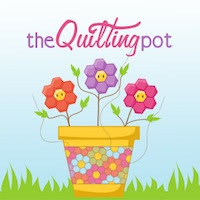 As you may know, or not, have pledged to participate in the FMQ Challenge 2012, FMQ along w/Leah Day and the finish along being hosted by Rhonda of "Quilter in the Gap" podcast. Although I haven't finished anything this quarter, my first will be my "Sushi At Christmas" wallhanging. I am in the process of quilting it now. I am stabilizing the top first. In the white areas I will be meandering, in the green and red areas I plan to attempt feathers. Finally, the border will be a feather design as well. That's a very big step for a beginner to do. It won't be perfect, but I can say that I did it. ** Just remember, I am learning. Here is a pic of the top I completed. It has a pinwheel block as a secondary design. You can find the find the information in McCall's Quilting, America Loves Scraps, Winter 2011/2012. The design is "Le Jardin Cerise", by Gerri Robinson. I used "1862 Battle Hymn" jelly roll by Moda. I purchased some yardage from the era for the backing. I don't have a name for my top yet..the jury is still out. The Christmas Baltimore Album BOM has started. I am now tracing the pieces onto Steam-A-Seam Lite. I have to admit, I did toy with the idea of needle turn applique, but quickly changed my mind. I would like to finish this in my lifetime!! There will be a difference in the look of the blocks..the images will be reverse. The pattern was not designed for fusible applique, so the images were not printed in reverse orientation. I have a knitting project to complete, 3x's a Charm Thermis for my sister. Completing the second buttonhole now. Then I will finish with a few more rows of 1x1 ribbing, cast off, add buttons and call it done. I should finish by this weekend. I am also working on my HPKCHC assignment. I chose "Arithmancy" for which you have to knit a tessellating design. I saw a blanket made from fish shapes. So, that's what I am doing for January. The design is by April from OK. Here is a pic of my fish. I will make six and use it as some sort of pad/coaster. Once I complete the fish, my plan is to attempt to make my first pair of mittens. I also plan to make a "Thorpe" hat. I'll see how that goes. Appropriate for a ADD crafter, I am planning to warp an 8/8 design on my warping board. The colors will be burgundy and gold. One of my groups on Ravelry, "Warped Weavers" is having a pinwheel weave along. I just happen to have the current issue of Handwoven magazine. (I subscribe) In the magazine there are 8 drafts for a pinwheel design. I will be using option 2. I will be weaving on my Baby Wolf. PS: Not sure what's up with the Font sizes..can't seem to correct it. I have tried several times, oh well.